Items 1 and 2 had to do with the file-size efficiency, and item 3 had to do with maintaining graphical integrity when the shapes are resized. Today we’ll discuss items 1 and 2. Tomorrow we’ll cover item 3. These shapes are well-built and precisely drawn, but when considering file-size, there exists a conflict between what’s good for the developer and what’s good for the end-user. This conflict is between ease-of-modification and shape-efficiency. By using lots of groups and keeping shapes separate, it is easier for the designer to update and modify the shapes. 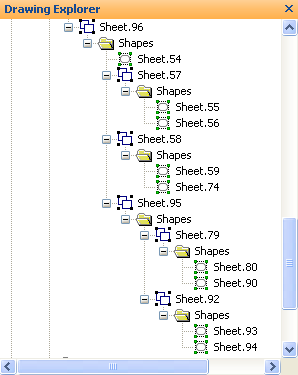 But more groups and more shapes means more ShapeSheets, which means larger file sizes. Two methods are used to reduce file size: getting rid of groups, and combining like-formatted shapes. Open the group window via Edit > Open Group. Note: if the shape is an instance of a master, then the menu item will show Open Master-name. Ungroup a bunch of times by repeatedly pressing Ctrl + Shift + U. While this isn’t really precise, but you can ungroup six or eight times really quickly with the keyboard shortcut. Hopefully you won’t have more levels of grouping than that! Now that is much simpler. You can see why we call it “flattening the group structure”! We could write code to automatically ungroup all sub-groups, but there are cases where sub-groups are legitimate. For instance, sometimes sub-elements need to be rotated and translated. It’s far easier to position such shapes by placing them in a sub-group that can easily be rotated and translated, all at once. Without sub-groups, you’d have to enter trigonometric formulas all over the place to get the sub-shapes properly positions. Note that there are two Geometry sections with five rows each. Combining shapes reduced the file size, because only one ShapeSheet (and all of its overhead) is required for multiple geometries. But all the shapes need to have the same line and fill formatting for this to make sense, since one shape can only have one set of formatting attributes. 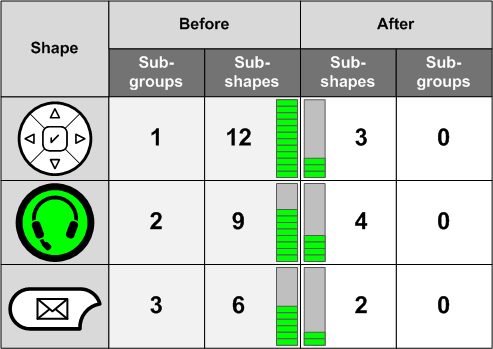 We can see that the number of sub-shapes is dramatically reduced, AND we uncovered an extra square that wasn’t needed! File-size-wise, after all the ungrouping and combining, the file was only reduced by 10 KB. (172 KB to 162 KB). 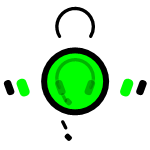 So the shapes were pretty clean from the start, and you’ve got to wonder if I used my time wisely. But I’ve seen other situations where shapes were very heavy with nested groups and separate shapes. Addressing items #1 and #2 on the checklist resulted in significantly smaller file sizes! Also, in a practical application, these shapes will likely be converted to masters and instanced many times. For every copy of a shape on a page, we’ll have space savings. 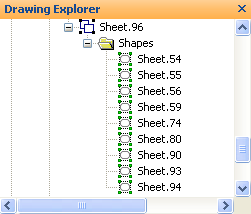 If several hundred shapes are on a page, the file-size savings might be more significant than we see here. The shape on the right shows the structure by changing the colors: the blue earpiece elements lay on top of the black headband. The red bits are then on top of the blue. In each case, the left and right elements were combined together, but the whole mess couldn’t be because of the coloring and the z-ordering. When making shapes smaller and faster, we run into a developer-versus-user quandry. In one state, the shapes are easier for the developer to create, modify and update. But that state is usually less efficient for the end-user. The ideal situation would be to have source shapes that can easily be modified, then pass them through some sort of automation treatment that simplifies the shapes for release. We’ve seen some sample code that points us in this direction. Unfortunately, some of the operations require human judgement (or way too much programming). Z-order issues are among these. In another article, , we’ll continue with the Cisco series by examining what happens when the shapes get resized, and how we can improve that behavior. You can read about it here: Smart LineWeight: Bigger Shape, Thicker Lines. The document itself takes up space in the file, so the savings on the masters will be smaller in comparison. Try comparing the total memory consumed when dropping 100 instances on a page. Or measure the time needed to add 100 instances. The runtime performance is also critical. The more detail you provide, the more coplex your shapes become. The will come a point at which you are forced to dumb-down your shape creation techniques.